When I first brought my daughter home from the hospital; I thought there’s nothing to it. I had my own baby-sitting business when I was twelve. I raised my younger siblings; I have been around children almost all my life. How hard could it be? I mean babies sleep most of the time anyways; well, those thoughts quickly changed when my daughter would not go to sleep for hours on end. She would go through her fussy period every evening where nothing I did would console her. Instead, it would upset her more. I was on wits on end. 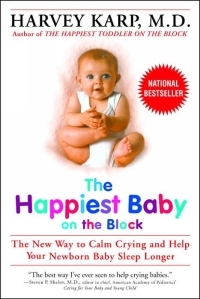 Then I came across this book, The Happiest Baby on the Block and it gave me hope when I felt I was about to lose it. According to the fourth trimester theory, humans are born three months too early. An evolutionary dilemma is presented by our having a head large enough to contain highly evolved brains and a pelvis designed for walking upright. The solution: we’re born just mature enough to survive, meaning a newborn is far from ready to meet the world. For Karp, it’s simple: babies are unhappy at this age because they miss the womb. Karp feels that instead of trying to teach their newborn about the ways of the world, parents should simply keep their babies snug and happy in a womb-like environment. This is where the 5 S’s come in. First is swaddling. My daughter was swaddled by all the nurses like a papoose, so when we got home; we continued on this tradition. It did seem to help her settle down although now at two months; she no longer likes to be bundled up. I call this this the burrito. Holding the baby in side or stomach position. Dr. Karp recommends that you can use this position until you settle the baby down and then turn the baby to the back; how all babies are suppose to sleep (unless your pediatrician says otherwise). This eliminates the startle reflex for some infants, because being on their back might trigger their fear of being dropped. that we use and works for that “white noise”. Also good in the wintertime to keep the air moist. with Infant Insert and it has been a life saver. If your baby doesn’t like to be held (there are actually babies who don’t; come to find out) then try a sling or a baby carrier. I highly recommend the Ergo baby. Sucking: Of course the answer is BPA free pacifier. Unless you are breastfeeding. Then no introducing the pacifier until couple of weeks. In a study by American Academy of Pediatrics; mothers who introduced the pacifier before six weeks of age would most likely to wean their baby earlier and not continue with breastfeeding. Of course, every baby is different. However, I did notice that first couple of weeks, when I resorted to the pacifier; she could not latch on correctly. So, the pacifier got put away until she was five weeks old. Now, we are going to bronze that baby. Of course, you are thinking by now; Erm yeah, every parents know how to do either one or couple of these things. It’s instinctive. But for a colicky baby, all the 5 S’s have to used simultaneously and it has be repeated until the baby calms down. Even for a non-colicky baby; during the baby’s fussy hour (I think all parents know what this is) this is a useful tool to have. I really enjoyed reading this book. It offers practical solution to a very stressful and even desperate situations. We all know how jarring a baby’s cry can be and when you can’t soothe your own; it’s heart-wrenching. But this book goes into the biology of the baby’s physiological state which shows why baby’s are colicky. Dispels some common myths that even most pediatricians are taught during their medical training; and offers a practical solution that works. It worked for me. It wasn’t the miracle cure; but it did definitely help. I have some issues with Dr. Karp. I think the super swaddling doesn’t work for all children, and I don’t think parents should be using energy just to create “white noise”. I have seen parents be afraid to deviate from his ideas when it isn’t working for their child, because he is an “expert” and they took a class at the hospital on his methods. That being said, I never had a colicky baby, and both of my babes were happy with baby wearing, on demand nursing, and cosleeping. i had a borderline colicky baby. we checked out the happiest baby DVD when he was like 7 weeks and it helped SOOO much. i like the DVD even better than the book, because it helps you learn swaddling that much easier. it especially helped my husband to see it being done. i only wish we’d found it sooner! Cindy, Thanks for your review on the DVD. I haven’t had a chance to try it out but I am glad it worked for you. I have both of the books, the toddler and baby one. They just didn’t do it for me. I have a degree in early childhood education and they make complete sense to me but the book on a whole weren’t my favorite. The tips for soothing a colicky baby are good but they can also be found in many other parenting books. The fan sound and tightly swaddled have always worked best for me. I hear gripe water is another thing that works for moms. Good review. Parents need to know about all the books out there. There sure are some great ones. I had a colicky baby and did read this book. I liked the info in the book but never felt like I was good at implementing all 5 S’s. We did use swaddling and white noise (and swinging, occaisionly) and both helped because our son was extremely sensitive to the enviroment around him. I was told by numerous people that the DVD is better than the book…I think this would have helped me “see” how it all works. As a side note, the very best swaddle blanket we found was The Miracle Blanket (http://www.miracleblanket.com/)…I have no connection to Miracle Blanket, just a satisfied customer. The review you made for the book shows that it’s really worth buying for all future moms out there. I wouldn’t forget all those sleepless nights I had during my baby’s first few months but I can say that our motherhood won’t be complete without those experiences. Hi Susie, I was wondering if you tried any products for colic like Colic Calm? It worked well for me, but I’m looking for other opinions. If you have please contact me at my web site, I’d like to publish your thoughts. I never used the books because I was lucky enough to have my mother nearby. I think I was also too tired to read. I can tell you this. If you have a baby who hates being swaddled it’s worth mentioning to the doctor. My son cried when we swaddled him and we found out that he’d broken his collarbone during childbirth. Not uncommon. Eco-Libris Green Books Campaign: Mama, Is It Summer Yet? The Smell Taste Connection: Got Flavor?